The five foot-long alligators found in a taxi Tuesday would never survive a Maine winter if released into the wild. 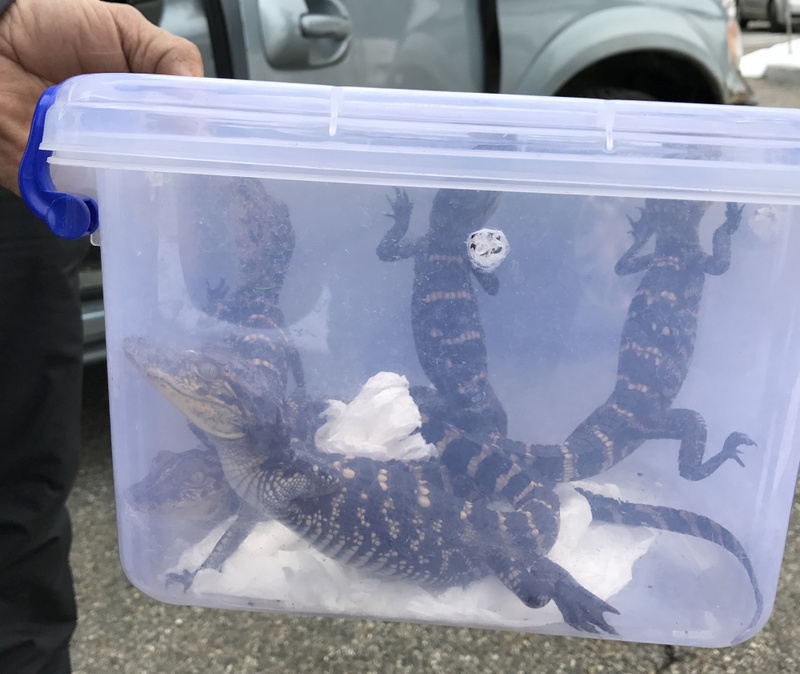 The discovery of five alligators in a taxi attracted a lot of attention in Augusta Tuesday, but such exotic animals pose relatively little risk in Maine compared with other invasive species. Greater threats to Maine’s woods and waterways are species such as the green crab, the emerald ash borer and the northern pike. However diminutive those species might look next to an alligator, they actually can survive here. Alligators, on the other hand, naturally occur in the southeastern United States and could not survive the winters in Maine. “It’s very unlikely (alligators) could become established in the wild in Maine, just because of the climate here, versus where they’re from naturally,” said Nate Webb, a biologist at the Maine Department of Inland Fisheries & Wildlife, on Wednesday. Police located the alligators in a taxi that had just arrived at the Concord Coach Lines bus station in Augusta. They were being kept in a plastic box, and their alleged owner, 20-year-old Yifan Sun, told police that he was taking a bus to Waterville to show them to his friend. Sun also said he was planning to ship the alligators to someone in Texas. The officers seized the animals and charged Sun with importing or possessing wildlife without a permit. 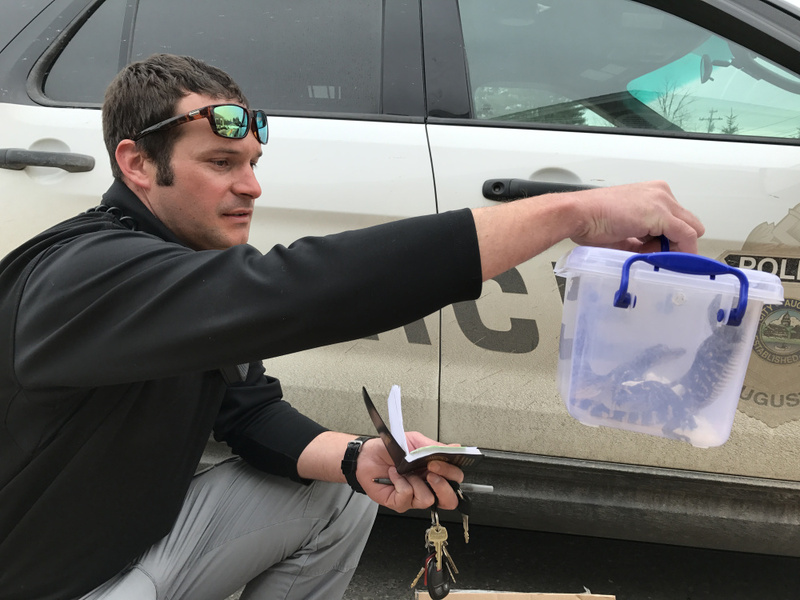 The young reptiles, each about a foot long, then were taken to a regional office of the Maine Department of Inland Fisheries & Wildlife in Sidney. A combination of state, federal and independent agencies works to contain damage from invasive species that are already here while also looking out for new ones. Such invasive species can harm some of Maine’s major industries. Originally from Europe, green crabs reached American shores in the mid-1800s and have increased dramatically along Maine’s coast in recent years, feeding on blue mussels and soft-shell clams and threatening those fisheries, according to the Maine Department of Marine Resources. Another species that has gained a foothold in Maine is the northern pike, which has been released in some lakes where they threaten other fish species, Webb said. Wildlife officials are also on the lookout for the emerald ash borer, an Asian insect that feeds on ash trees and has decimated forests in New Hampshire, Webb said. The threat to Maine forests is serious enough that the state prohibits importation of firewood from other states so larvae can’t be brought in.